This trek actually started 11 days ago when I left from work and drove through Surry County trying to find something to put under some clouds. While I was driving, I came across a driveway with a 280ZX in it, and those always catch my attention since I owned a '72 240Z back in my youth. Well, while I was looking at the Z, I saw what looked to be a '50's sedan sitting in front of a garage in the next driveway. Wait...that looks promising! I turned around and took a second look. Yep, it was a '50 something Ford sitting in front of a double garage with some bright yellow windows. This looked pretty cool, but the sun was directly behind the garage, and the lighting was terrible. I decided to pass on this today, but to save it in my mind for later on. Well, today became later on, as I found myself free all afternoon. The clouds were building in the sky and looking very nice. I was almost wishing I was headed to the mountains to get some of the scenics that I was looking for yesterday. But, I was in the Lumina and didn't want to go that far. As I was starting to contemplate what I was going to shoot, I decided I would head back out to Surry County and see what I could find. 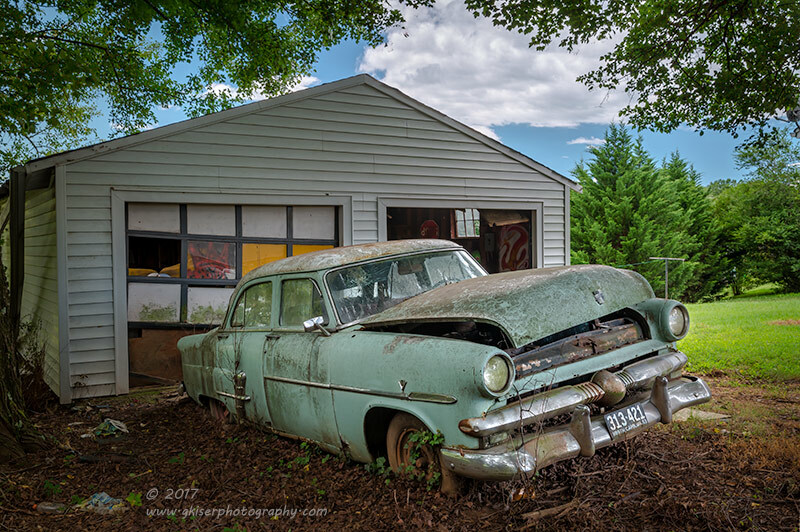 In the past week or so, I had been looking at the map of where the Ford sedan was located and decided that there would never be a great time for the sun to shine on the car because of its position beside the house and trees. I was going to need some shade from clouds, but I was wanting some blue sky or at least some good cloud texture. The sky was looking like it might provide a little bit of that recipe...at least enough to justify driving by to check it out. When I got there, I drove past the house to get a look without committing myself to the driveway. What I saw had a lot of promise. The car was completely in the shadows, but evenly lit since the sun was basically overhead. There were passing clouds in the sky, and it really looked like I was in luck. Hopefully, my luck would stand long enough to have the owner at home since there was no way I was going to be able to shoot this car from the street. I pulled back to the driveway and went to the front door. I knocked and waited. After what felt like a minute, I decided that nobody was home and started to turn around. It was then that I head the door open and I was greeted by what turned out to be the car owner. He actually owned the 280ZX as well, which made for a really good conversation. Z folks love to talk about their Z's, which means we love to talk about how quickly they rust. He was a really nice guy, and a self admitted "car guy," so when it came time to ask to photograph the Ford, he was very gracious and let me have my way with the old car. With the introductions out of the way, I went to the trunk and got my gear out...Oh, did I mention the owner wants to learn photography too? Yeah, this was a great meeting! I found the compositions difficult because of where the houses were located, and I had to be careful about what parts of the sky entered into the picture. I started shooting from the driver's side as that yielded the easiest compositions. For this, I chose to use my 24-70mm lens which is an amazing lens for automotive work. I added an intensifying polarizer to reduce the glare, and saturate the colors. However, I was less than impressed with how the pictures were looking. They seemed to be just a regular snapshot, and were lacking in artistic presentation. I moved over the passenger side, and found a much better composition, but the sky claimed a large portion of the frame. I could tell by looking at the histogram that I was going to have a really hard time capturing all of the detail here in one shot. Either the car was going to be too dark, or the sky was going to be totally white. For this composition, my only choice was an HDR shot. Even an ND Grad would not work because of the angle in the roof, and the fact that I had trees coming in from the top of the frame. I got everything set up and tried to wait for a lull in the breeze since I wold be stacking the images with tree branches moving around. I got my lull, and started to crank off images, one after another. I ended up shooting six frames at 2/3 stop increments to capture all of the detail. When they were blended in Lightroom, I had a lot of data to work with from the lights to the darks. I spent about 30 minutes working on the picture, which is a very long time for me. However, the resulting image was exactly what I was hoping for. It captured the yellow in the garage, the patina on the Ford, and grabbed a really nice cloud in the Carolina Blue sky. I must admit, I was stoked about this image when I put the final touches on it. 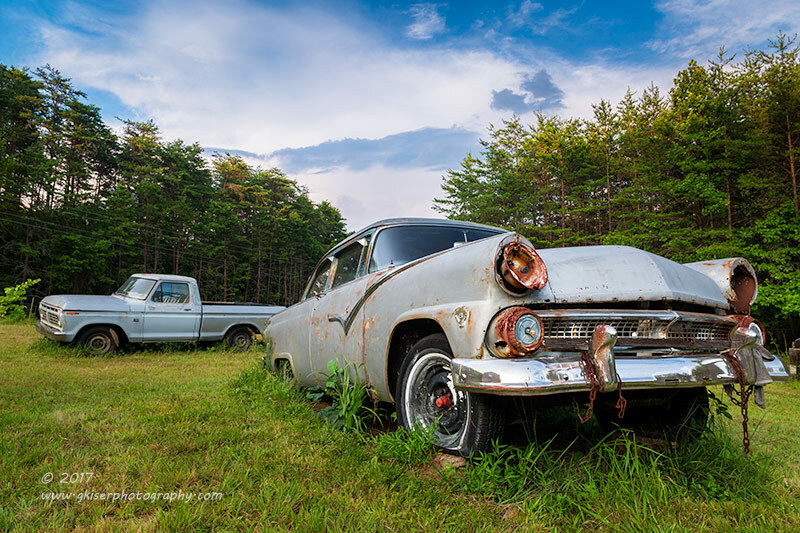 This image along would have made it worth my time and effort going out to Surry County to shoot 29 frames on this car...but wait...there's more. Knowing that I had the shot that I wanted of the full car (or at least had something I could fall back on), I could have stopped here. 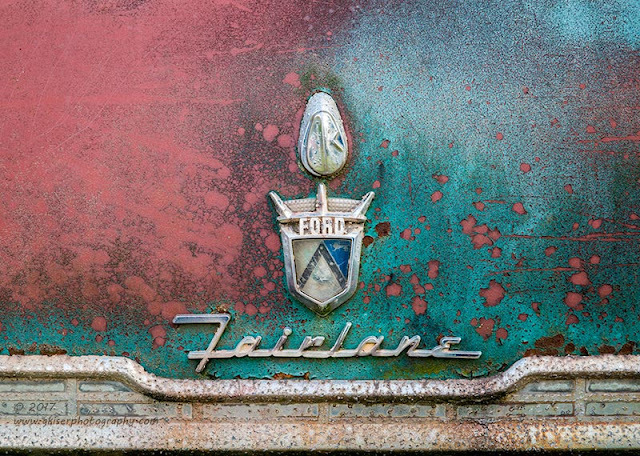 However, one thing that I have learned over the years, but have a hard time remembering is that sometimes the gold is in the details of these old cars. I decided to not worry about the entire car any more, and concentrate on some of the elements that make the cars from this era so amazing. The bumper had caught my attention early on with the single bullet cone, and the vertical bumperettes. There was even a hand painted vintage tag from 1953 attached to the bumper. All of these things were very appealing to me, and I figured that I could capture that essence with the camera. I got in close to the front of the car, and got the camera down low. I frame things very carefully, so I wouldn't have to crop later on. I dialed in the exposure that I knew would work and shot the frame. The histogram told me I nailed it, and the composition was perfect. There was nothing else that needed to be done on this shot, so with that one shutter release I was finished with the bumper. Having shot the bumper, I started to look at the hood emblem. 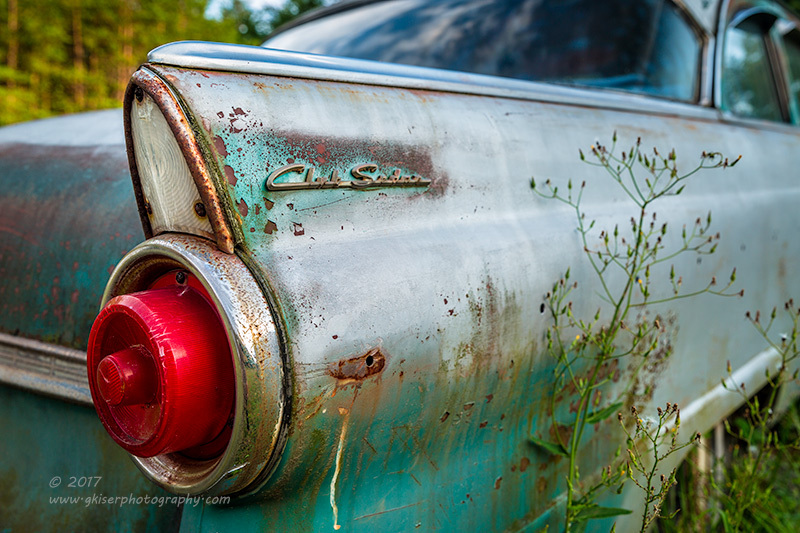 It was small, and very similar to the one on the Ford Fairlane I shot a couple weeks ago. The more I looked at it, the more I really wanted to shoot it. There was just nothing around it to make for an interesting composition. 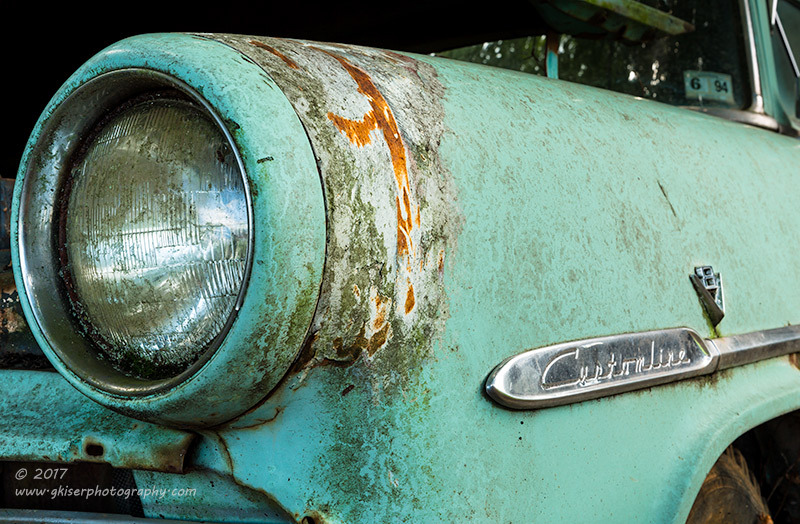 The wonderful patina of the car was pretty uniform around the emblem, but I wasn't sure how that would work in a full picture. The cracks in the emblem and the general wear really intrigued me, so I decided to do what I could with it. I got in close....like macro close and set my exposure. That was no problem because the lighting was overly simple with this shot. I tried both landscape and portrait, but neither really grabbed my attention, so I settled on a standard landscape shot. My intention on this one was to do some pretty heavy post processing to really bring out the story behind the emblem. This is not so much a honest picture as it is an interpretation of the subject. It is still true to the subject, but has a great deal of pop now. Since I couldn't decide on portrait or landscape, I went with a roughly square ratio and put the emblem dead center. It seems to suit it well. This was another one shot and move on picture, and I'm quite glad I decided to focus in on the emblem even though it seemed a little boring photographically. I was far from done with the emblems though. I moved over to the front fender of the car which was trimmed out with a nice chrome strip and the V8 badge. It seemed to flow well with the bumper chrome, and the headlight bucket was set off by some rust that contrasted with the largely horizontal elements. I set the camera up low in order to keep the perspective from going weird, and dialed in a very narrow depth of field to throw the background into blur. I composed very carefully in order to capture only what I wanted, and nothing that I didn't. I hate cropping after the fact because I loose valuable pixels for large prints. My exposure was pretty simple since the lighting was nice and flat. Again, it was one shutter release and I moved on. Sometimes, I just have it on a subconscious level, and don't need to second guess my pictures. 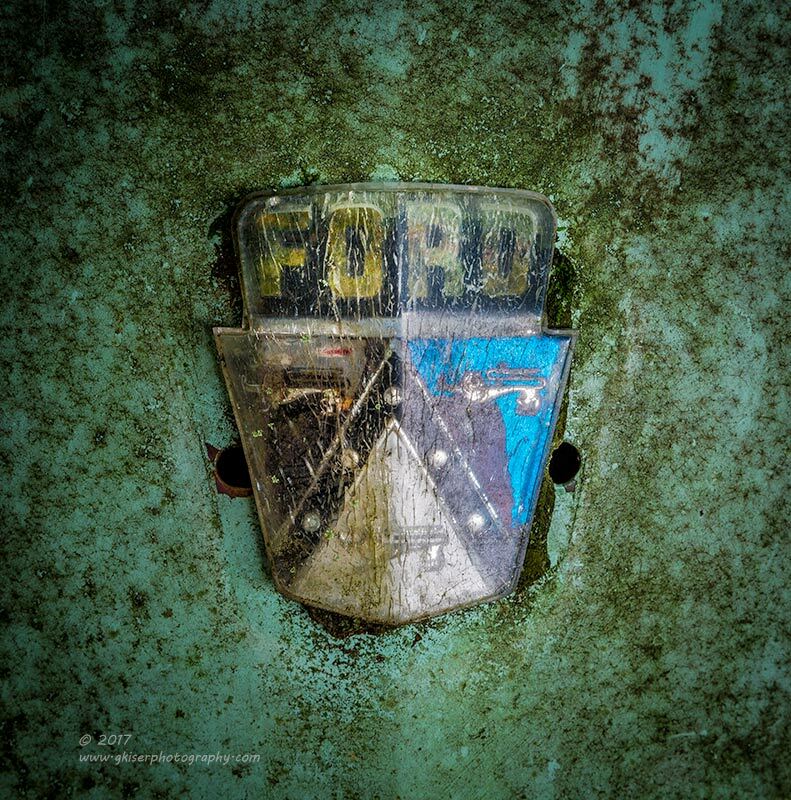 Speaking of that rust to the rear of the headlight bucket, and the chrome trim...there must be another composition there to add a little drama to the whole thing. Surely there must be! Wouldn't you know it...there was. I moved to the front quarter, and really started to dial in a tight composition that anchored on the headlight. What I was seeing on the LCD as I was composing it, was a car that was about to jump right off of the page and land in my lap. that was exactly what I was going for. I was able to include everything in this shot I wanted to. The headlight, the rust, the Customline trim, the V8 badge, and even an inspection sticker to show how long this car has been off of the road. It all came together so well. I then found myself hunting other compositions, but not pressing the shutter button. I was pretty sure I had done what I could with this car. At the time, I was pretty sure that I had at least a couple of usable pictures, but I wasn't sure exactly how good any of them would be. I was still in the mood to shoot, and the sky was still looking pretty good, so I started to drive around some more. I came across that orange Z at the junk yard once again, and thought seriously about trying my hand at it real quick. I pulled into a parking lot to get turned around and the Lumina started to make a strange noise. At first I thought it was something caught on the tire, but quickly realized that it would still pop when I wasn't rolling. I figured that it was a belt, since it would change speed at strange times. Everything was running fine, so I decided to get home as quick as I could. That meant cutting the afternoon short, but I'd rather do that than get stranded. It turned out that the belt was starting to fray and I was hearing the pieces coming off of the belt at it turned. I got to the parts store and picked up a new belt, and had it replaced in a matter of minutes once I got home. I might like photographing abandoned and derelict cars, but I'm not too keen on driving one in that condition, so I'm happy that I was able to get the Lumina back on the road with a minimal amount of fuss. Let's just say that this has been a very long week. I've worked my 40 hours in the first four days thanks to several special assignments. That meant that I got to take Friday off, and a Friday off means a trip to the mountains. The weather was supposed to be cloudy with a few passing showers in the morning. It was going to be a great waterfall day, but there has been only a little rain recently, so I figured that I would try for some landscape shots. Looking at the sunrise forecast, the mountains were expecting a middle of the road sunrise. 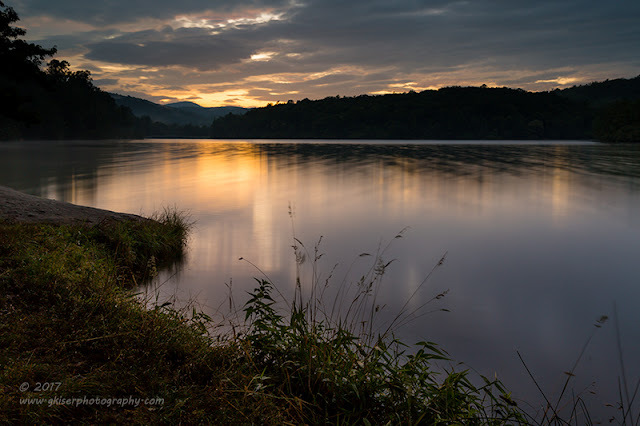 The decision was made to head out to the section of the Blue Ridge Parkway near Boone, and possibly Cone Manor for a sunrise. From there, I would follow the clouds. I woke up around 3:30am and checked the weather once again. The clouds were still a little thicker than I was wanting, but the sunrise forecast was showing even better than the hourly would suggest. I went ahead and got up and got dressed. The trip out to the Blue Ridge Parkway was pretty normal, and I wasn't really paying that much attention to the sky since I was expecting there to be nothing but clouds. While I was driving, I was thinking about the sunrise forecast and thought that if there was going to be a good deal of color in the sky, I would like to really take advantage of it with having water below. That meant that I was going to head to Price Lake. I had just enough time to get there before sunrise. I arrived at about 6am, which gave me just a few minutes to set up and find a composition. Not having much time, I went to where I knew and I set up using my 24-70mm lens with a 2-Stop ND Grad filter to control the sky. I found my place that that gave me a decent foreground and guided the eyes to the distant mountains. The opening photograph here was the first one of the day and represents 20 seconds of exposure. It did a great job at picking up the slight color that was peeking through the holes in the clouds. It was almost as if the sunrise forecast knew that there would be a hole in the clouds right at sunrise. As the sun climbed further into the sky, the colors above changed, and I changed along with them. I kept recomposing to take advantage of the scene that was unfolding in front of me. I eventually changed out my ND Grad for a 3-Stop filter to keep the highlights in the sky controlled. I was moving around about every other shot, and eventually swapped in my 70-200mm lens to try and get the distant mountains with the gold surrounding it. I was doing a lot of work over the 30 minutes that there was color in the sky. The sky reminded me of when I was learning to shoot sunrises. I would always add an 81C warming filter to the camera to introduce color when there wasn't much there. This time, the sky was actually that warm golden color, and all I was doing was darkening from the horizon up to keep the sky and water evenly exposed. 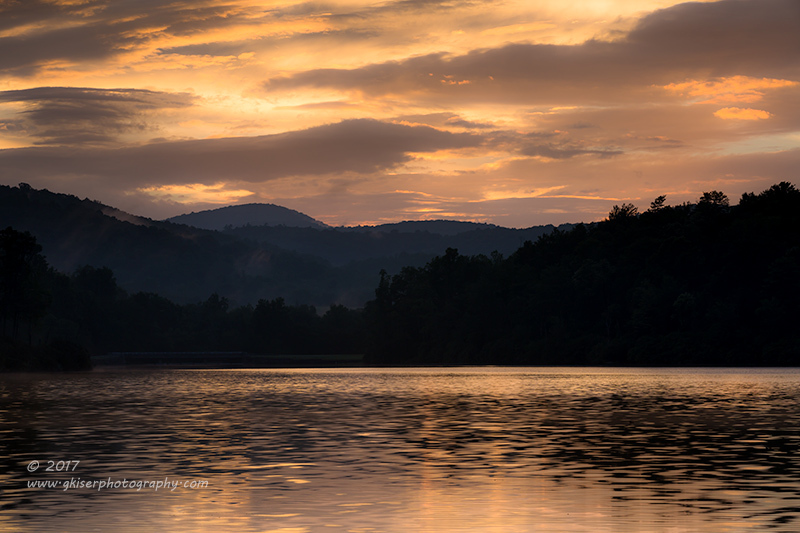 The LCD was really looking like my old Sony when I would shoot Salem Lake though. It was like a trip down memory lane for me! Shortly after I shot that last picture, the color in the sky quickly diminished leaving gray clouds, and a bright sun peeking through. I started to look for some other targets of opportunity and found a tree that looked kind of neat in the sunlight. I struggled to get a composition and thought that I had a few good ones. Unfortunately, when I got home and started to look at them on the computer, they lacked any real artistic quality. I decided to chuck that series in the long run. I did start walking around the lake trails to see if there were any woodland scenes that I could shoot. I found a few with some nice ferns, but like the tree before, they just didn't turn out well at all. I had walked through the amphitheater and saw that the stage was a nice stone element that caught my eye. The problem was that there was a bunch of junk around it that wasn't really photograph worthy. 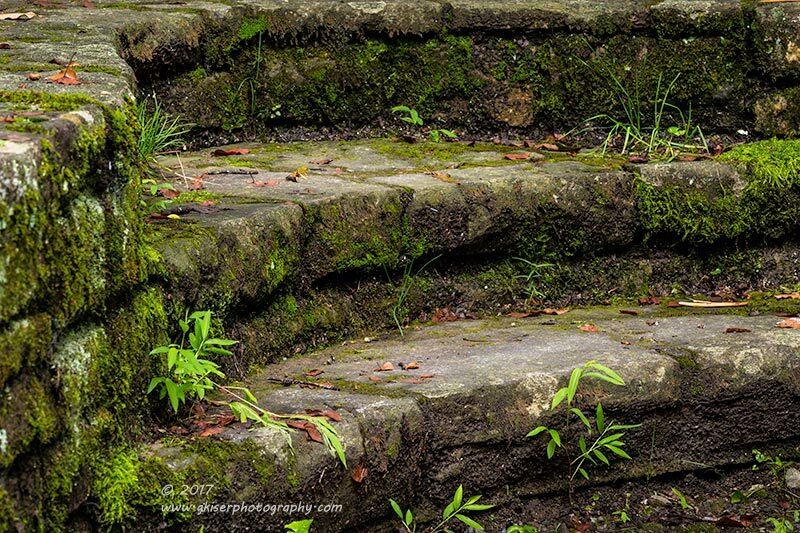 Since I still had my 70-200mm lens attached, I decided to take an abstract approach to the stonework. There were steps to the right, and they were connected to the curve of the stage. The lines really captured my eye, and that was what excited me about the scene. I got positioned so that I filled the frame with nothing but steps, and I used some of the weeds and moss to frame the shot. Admittedly, it was starting to rain at this point,and the shading was rather flat. I still liked the concept, so I kept shooting slightly different compositions. I knew that I would be doing some dodging and burning to get the contrast back to the scene in post processing, which I did. The final product turned out pretty much like what I had envisioned it when I was setting the shot up. At this stage though, the rain was coming down pretty good, and that meant it was time to pack it in. I took the quick walk back to the truck and put everything away under the cover of the lift gate which was very nice in the rain. I debated about staying at this point. I wasn't really sure that I had gotten much with the 40 frames that I had shot. It wasn't looking like the sky was going to get much better, but I did remember the old mantra from Appalachian State: "If you don't like the weather, wait five minutes." OK, I'll go drive around and try to wait that five minutes to see what happens. Well, I drove for about 45 minutes and nothing really changed. I decided to give up on landscape photos and go off on the spur roads in search of barns and general farm life scenes. Well, I found some barns, but nothing really photo worthy, and it was still raining. It was a nice little road trip through the country at least. Then I saw something that caught my eye. I saw something old, and I thought that it might be a Mustang. I put the 4Runner in reverse right in the middle of the road and backed up to see what I had seen. Yep, it was an old Mustang. Something that I have been trying to get a photograph of for the longest time. 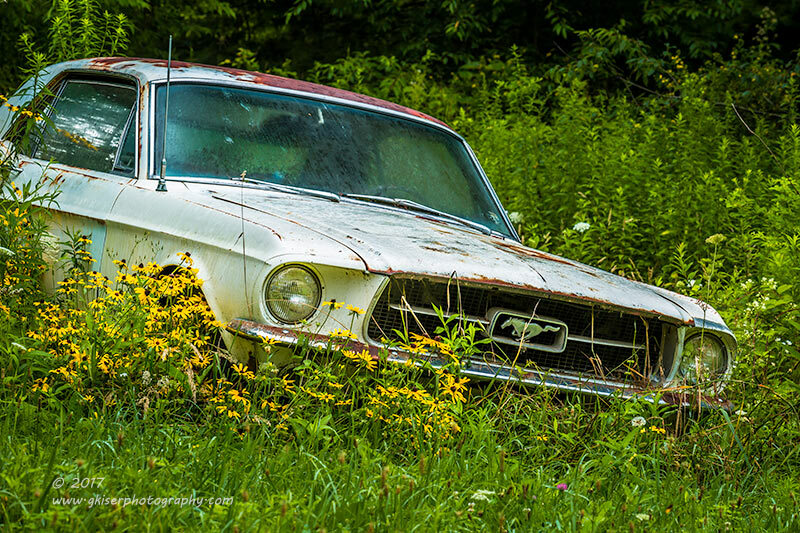 There is nothing quite as iconic as a Mustang, but because of that, they are hard to find sitting derelict in the weeds. I now had one, but it wasn't without its problems. First of all, there was a Chevy Lumina just to the rear of it, and there was no way to crop it out and shoot the entire Mustang. Second of all, there was a large "No Trespassing" sign posted near the front of the Mustang, so there was no way I would be able to get in close to it. I was limited in my options, and figured that the best course of action was to use my 70-200mm lens for the extra reach. I added an intensifying polarizer to reduce the glare caused by the rain, and pump up the colors a bit. Respecting the sign, I shot from the shoulder of the road to stay off of the property. I framed the shot tight on the car, and opted to crop out the trunk area to avoid the late model Lumina. This was tolerable in my book because I'm not a fan of the coupes anyway. Had it been a fastback, I would have been a bit sadder at having to crop it. My focus was on the front end of the car and the yellow flowers that were growing along the corner of it. The faded white paint helped to make the Mustang pop against the green. Not wanting to overstay my welcome, I decided to pack up and get ghost before anyone could come and have words with me. I was pretty happy with finding this old Mustang, and started to see my day looking up. 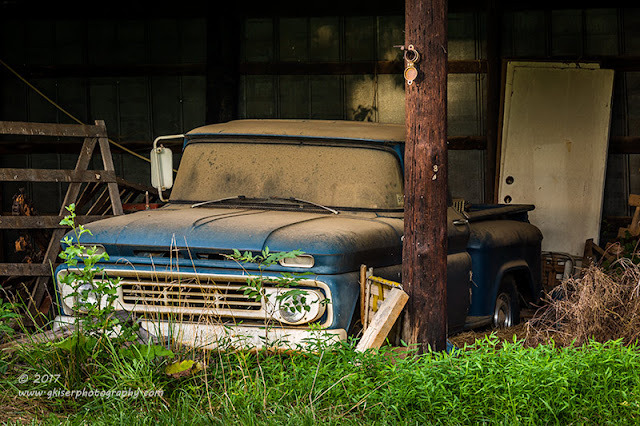 I started looking for more old cars and barns as I was getting more and more lost. It wasn't until I ended up in Jefferson, near our anniversary cabin that I knew where I was. With the rain starting to clear, and the clouds getting some definition, I decided to head back to the Parkway to see if I could get any grand landscapes with the clouds above. When I got back on the Parkway, the clouds looked nice directly above me, but everything near the horizon was just a blank slate of gray. Grand landscapes were not looking like an option today. I started driving and searching out light to see if I could make something work out. I did find a fence line with an old red gate. Of course, I am a sucker for red gates, and this one was in the tall grass. It made for an interesting setting, and there was a bit of sunlight on it to boot. I pulled off the side of the road and grabbed the camera. 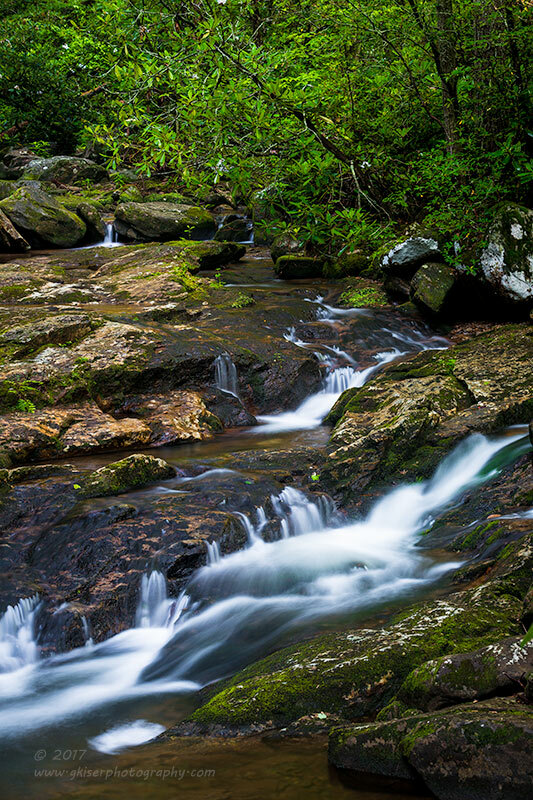 I started off with my 24-70mm lens and a polarizer. This gave me a great deal of flexibility in my compositions. The problem was, I didn't like any of the compositions I was trying. I wasn't able to include the sky due to no texture in the clouds at all. That meant that the trees were my backdrop, but the compositions didn't make sense. What I found was that my only option was to get in tight and get an intimate shot of the post and gate. I flipped the camera on its side and framed very carefully, paying attention to how much red was showing in the gate. I used a very narrow depth of field (f/8) to keep the attention on the wood textures. The gate was there for color, and horizontal lines only. I didn't need sharp detail on the metal for my concept. What I ended up with worked rather well, and Toni even says that it is her favorite fence picture. Well, I guess I did something right with that. While I was setting that shot up, I kept looking across the road to the field. The yard was well kept, and there were several trees present throughout the yard. One of them in particular caught my eyes with the drooping greenery. I wanted to photograph it, but was having a hard time figuring out how. The sky was lacking a lot of detail, but was better on that side of the road than what I had been working with. It was also a far distance from where I was able to shoot. Everything that I tried caused the tree to get lost in the landscape. I finally decided to fit my 70-200mm lens to see if I could work a tight composition instead. The long lens did the trick. I was finally able to isolate the tree I wanted, but now I was needing another element to the shot to make it work. There was another tree to the right that was a comparable size, so I decided to get positioned so that I could have that tree ever so slightly overlapping the primary focus. While I was doing all of this maneuvering, the clouds were coming back in once again. By the time I had a composition that made sense, the clouds were rather blah, but there was some texture to them, however slight. I didn't bother with a polarizer since there was no blue in the sky, and since the sun was shining down on my position pretty strong, I just left the hood on the end of the lens. When I made the shot, I looked at the LCD which appeared very featureless in the cloud area. The trees looked good though. The histogram showed that there was detail in the clouds, so I hoped that I would be able to bring that detail out in the final image. It wasn't until I got home and started to work the image, that I found there was a good amount of detail in the sky, and with a few adjustments and a bit of dodging and burning, I was able to get a pretty interesting sky from the RAW image. It is still a simple image, but it is well balanced, and the overall presentation is pretty satisfying in my eyes. Ironically, even though the sun was shining on my head, those clouds were bringing rain. That was my clue to pack it up and head home. I was getting tired of being caught in the showers at this point, and it was getting very close to noon. It had been a good day, not great, but decent with 62 frames exposed over about 5 hours. I had gone up there to get landscapes, and I ended up with landscapes, abstracts, rustics, and even an old car. My mind was open to the possibilities, and I seized the opportunities when they presented themselves to me. The original plan was to head out after work and take advantage of the clouds by going to Pilot Mountain. I wasn't sure if I would be shooting the summit like I would normally do though. I was kind of feeling going for some slightly different views, and possibly doing a little hiking around the summit. As I left work, I was starting to change my mind though as the clouds were looking really good. In fact it was starting to storm, and I had a quick thought of maybe being able to get some lightning around the summit. By the time I got home, the storm was in full swing, and I looked at the weather app to see how much time I had to play with. The storm was going to be ending in about 45 minutes or so, and that worked out well. The hope was to get the clearing sky behind me to light up the summit, while I got the regressing storm front as the backdrop for the mountain. I grabbed the camera and headed out with a purpose. I made it about five miles from home before I realized that the clouds were already starting to break up. I pressed on hoping for the best. By the time I reached Pinnacle, there was nothing but clear blue skies with the storm clouds well off in the distance. I could even see that the summit was rather hazy with the heat and humidity of the afternoon. 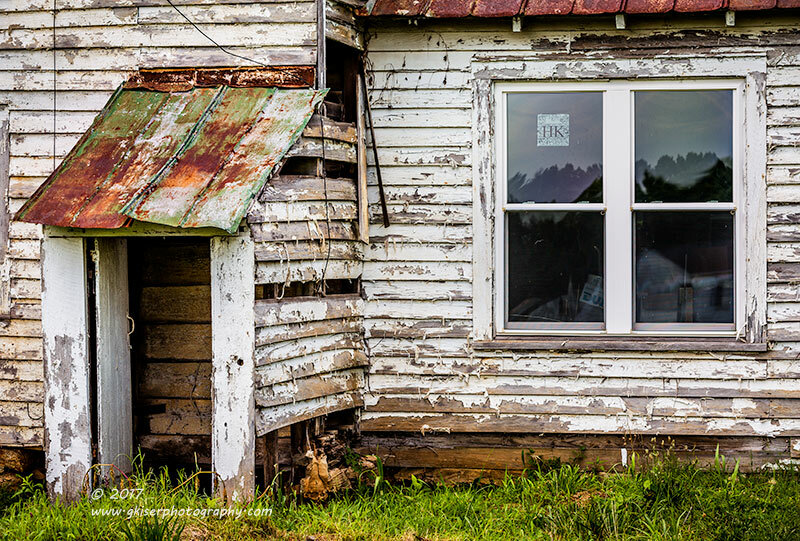 The decision was made to abandon Pilot Mountain and start looking for barns out in Surry County. I exited off of the highway and started my meanderings around Hwy 268. I did find a really cool old car in front of a dilapidated garage, but the sun was to the rear and the shadows were all wonky. I will be back to that location though as I do see a lot of promise with the setting. I also found a couple shops with salvage yards in the front that had some promising vehicles, but again, the lighting was too harsh to really take advantage of it. Since they were packed in pretty tight, I decided not to wait to see if the lighting changed any. 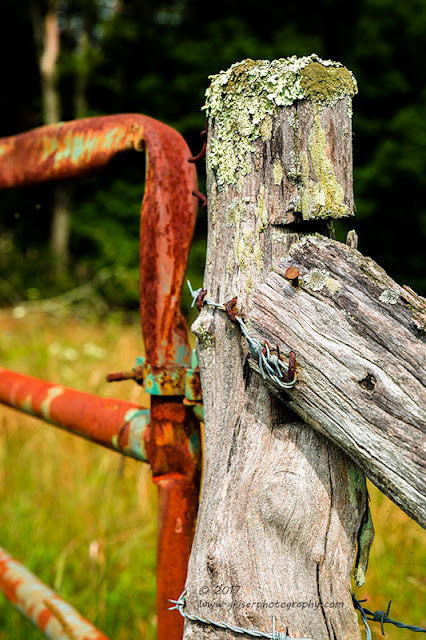 I was finding no barns out here, and it seemed that my eyes were being drawn to the old iron instead. At least I was finding some things here and there that caught my eye, but nothing that I could really work with. It felt like I was driving forever just aimlessly milling around. I started to dip back and forth between Surry and Stokes Counties on some roads I had never been on before. It was starting to feel like a bust and the sky was still not working with me, but I was getting closer to the clouds at least. I finally found the edge of the front and the lighting immediately changed for the better. I still had the warm sun to my rear, but the sky was a good deal more interesting now. I just needed to find something to put in front of my camera! I found myself on a road I had passed many times, but never driven down. There wasn't much to see on this road, as it was just a simple country route. However, something caught my eye as I drove past a modest home. There was an old pickup in the front yard. But just beyond the truck was an old Ford with grass growing up around it. There was a hint of color to it, but it was primarily in primer. It wasn't perfect, but there was a good deal of greenery around it, and the sky was looking good above. I got turned around, and came back for a second look. I was going to have a hard time photographing it from the street, so I was looking to see how possible it would be to get in closer to it. As I was pondering, I saw the front door to the house open (which surprised me as I really thought the house was vacant). I took this as my opportunity to park and speak with the owner. She was a very nice lady, and we had a pretty good conversation about the car. She told me it was a '55 Ford that had belonged to her late husband. He had picked her up in that car when they were dating and I could see that she was still quite excited about the thought. 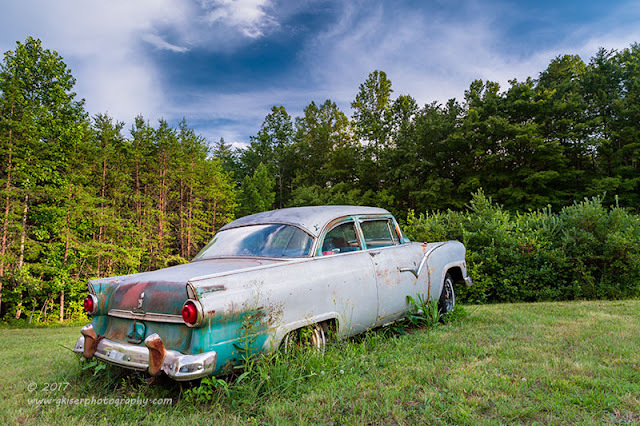 She described the original color as "mountain green" and that color could still be seen at the rear of the car. The car was now her son's, and the intention is to restore it to the original condition. She was happy to let me photograph the car, and I jumped at the chance, especially knowing some of the history of it now. I went back to the 4Runner and grabbed the camera fitted with a 24-70mm lens and an intensifying polarizer. I started to work out compositions from the rear of the car since that was where the light was the best at this point. I was really wishing for more color and less primer, but I was able to find patches of color on the car that made for pretty good compositions. The trunk lid was probably the best piece on the car for getting the color, and the natural patina. It just so happened that there were emblems still in place, and I saw a great intimate composition in that. I just love the way age pits the trim, and the paint starts to peel away in the sun. There is just so much texture to play with. I started to look for other intimate compositions but had a hard time picking out interesting areas because for the most part, it was just a plain gray. Having had a fair amount of luck with the emblems on the rear, I started to look at other trim work and lines on the rear quarter panels. The emblem for the model was still in place on the passenger side, as was the tail light and reverse light. I started to work this area next. Just wanting to capture the trim at the rear, I went with a narrow depth of field to through the rest of the photo into blur. F/5.6 seemed to do the trick, and I anchored the whole picture on the red tail light. Of course, the red was quite deep, and needed to be balanced with some cool tones which came from the "mountain green" around the model name, and the lower quarter. 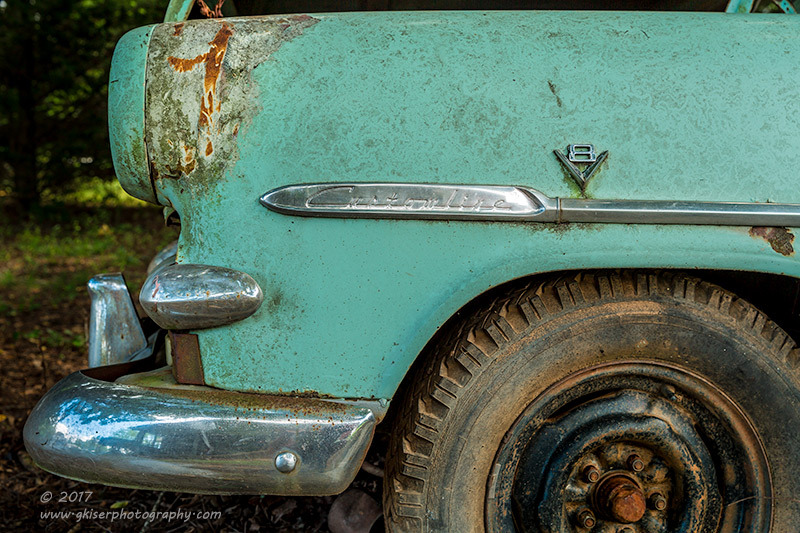 I had my pitted chrome and my peeling paint. There was even a natural framing element with the tall weed that was growing just behind the rear wheel. It wasn't my normal shot, but it was one that I was rather excited about. I still wanted the picture that captured the "story" of this car. I wanted something that showed its past, the memories, and the hopes for the future. That was one tall order for sure. The truck that I had seen first from the road was also the husband's vehicle and I felt that it was a part of the story as well. I tried to capture a picture that included the truck as the foreground and the Fairlane in the background. That didn't work out well enough because too much emphasis was given to the truck. The only way to make this story work was to capture the car in the foreground, but that presented a myriad of problems. When looking from the front, there was a house to the left, and a storage building to the right. To make matters worse, there was a storage trailer beside of the building. These elements were very distracting to the image that I had in mind, but I was determined to find something that I could do including only the car and the truck. I got down low, and used a wide angle (24mm) to emphasize the front of the car. This essentially hid the building and trailer to the right and simplified the composition. A side benefit from using such a wide angle was that I was able to capture the sky as well. There was a nice patch of interest in the sky right above the car which served as a visual framework for the composition. The touches of red in the rust and in the center of the wheel gave the picture some much needed drama. The truck was there, but not overbearing. There was a slight bit of overlap showing the connection between the two vehicles. My issue was the exposure latitude with the sky. I thought about adding an ND Grad to the lens, but decided that would not work out due to how the horizon was. I opted to shoot this one as an HDR image instead. The difference in exposures were not terrible so I did a modest three shot capture and blended them in Lightroom later. What I ended up with was something very close to how I envisioned the shot when I was setting it up. With that, I was done. The thunder was starting, and I was dripping with sweat. I packed up my gear and spoke briefly with the owner once again before leaving. I was quite thankful for the time she allowed me with the car, and for the story behind it. I just hope that I was able to do it justice. By now, everyone should know the love affair that I have with the weather forecast. No matter what I plan around the weather, I always get bit in the rump. It is frustrating to say the least, and it does wear on me after a while. I spend hours, and sometimes days formulating pictures that I want to make based on a weather forecast that usually ends up being incorrect. I'm then forced to try and find other ideas to photograph. This weekend started out with me seeing that there was bright sun every day, and I decided to stay at home. This was actually a great thing because Toni was home, and we could spend some time together since most of her time away from work is focused on her nursing school. By the time Sunday rolled around, we had plans for the middle of the morning, but I saw an opportunity to get out for a very brief trek right at sunrise. The weather forecast was still pretty steady, calling for clear skies. Saturday had seen more clouds than were forecasted, so I had some hope for a great sunrise for Sunday morning. However, I decided that I would plan on no clouds since that would take a bit more planning to make a trip worth while. I decided on Doughton Park because there is a group of trees right at the entrance I had photographed some time before that caught my eye. They were positioned perfectly for a sunset, but I could also see some potential there for a sunrise shot using the twilight colors opposite of the sun for the visual interest in the sky. 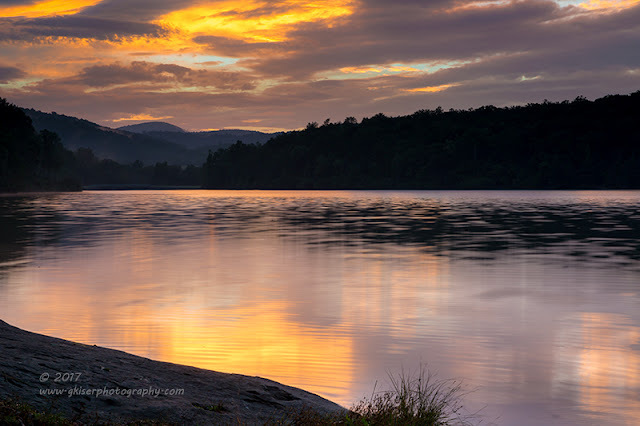 It was a compromise between shooting a sunrise, and not having any clouds to capture the color of the sunrise. My morning started at 3:15am so that I could be at the park by 5:30, which would give me about thirty minutes to work with to get set up, and find a composition I liked. The trip was uneventful, but I did drive through some light fog through the foothills. I was actually getting excited that I would have some great conditions to work with for a "real" sunrise shot. My plan was to be wrapped up by 7:30 regardless, and back on the road home. If there were going to be great clouds, I was going to have to shoot and run, but that would be ok with me. 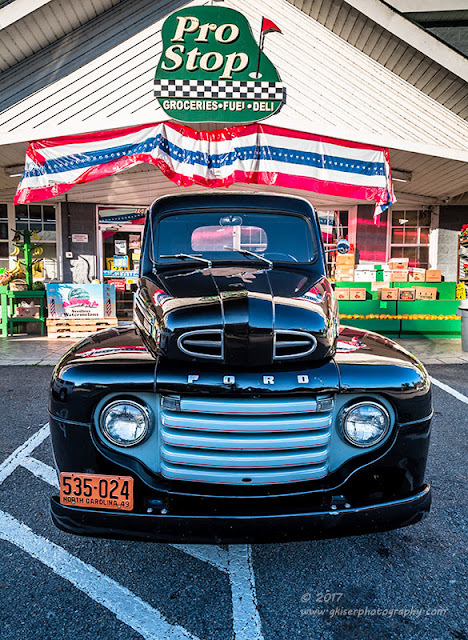 As I was passing through Roaring Gap, I saw a store front with a really nice old Ford pickup on display in the parking lot. It wasn't my typical old truck, but it did catch my eye. The lighting was terrible though as the sun was far from coming up, so I put it in my bank to think about later. I had to get to Doughton, which was still about 20 minutes away. I could see that the sky was clear which didn't really matter since that was what I was planning on, but something was there that I hadn't really considered. A full moon was hanging in the sky, and that posed some interesting possibilities for my morning shoot. I got to the park at precisely the time I had expected, and found it to be empty which was wonderful. When I got out of the truck, I found it to be incredibly windy...and quite cold. That was not nearly as wonderful. Wind poses problems for low light photography which requires longer than normal shutter speeds. I was going to have to deal with that as the problems presented itself though. I needed to get set up. The choice for the morning was my 70-200mm lens so that the moon would render as more than just a speck in case I chose to add it into the composition. There was no need for filters as the exposure latitude opposite of the sun was pretty even. I set up on the road, right at the fork in the road between the picnic site and Wildcat Rock. It was just a matter of waiting for the sky to turn pink at the top, and work its way down. The color change was very faint and very gradual, but it was there. I started getting some shots that showed the color, but the trees were blowing too much in the wind. My only recourse was to adjust the ISO which I rarely do. It was cranked up to 640 which was higher than I had shot before. Fortunately, I do trust that the 5DM3 will capture a dark image at this ISO fairly clean. I was able to keep my shutter speed under control, and I found that the branches were mostly frozen which was what I was after. I worked around several different compositions that I liked to varying degrees. 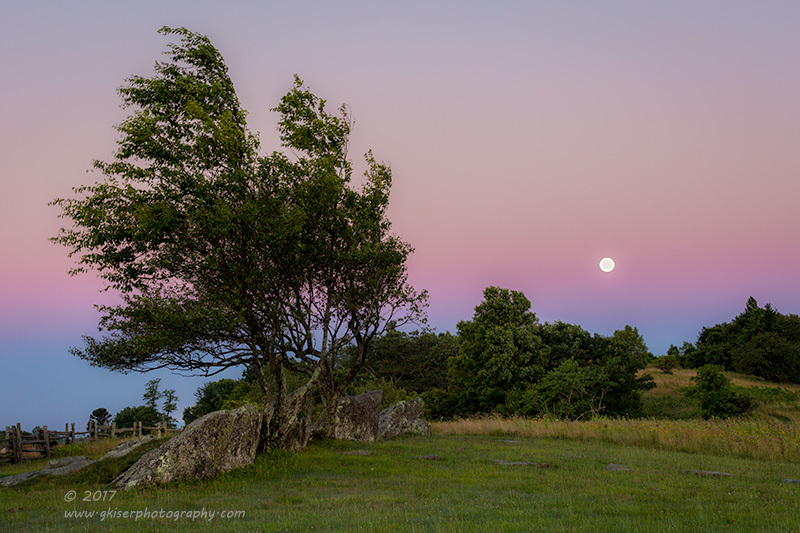 However, I got the idea for a panorama to capture the fence, and the long twilight wedge, known as the Belt of Venus. I already had the right lens on the camera, so I flipped it over on its side. The tripod was leveled and a dry run sweep was made across the entire scene to make sure that the camera was plum. I kept the ISO elevated to keep the shutter speed fast enough to hopefully freeze the tree which was gotten in a single shot to make sure that there was no difficulty overlapping the branches. Each of the eight frames only lasted a fraction of a second with the whole process taking less than a minute to complete. I tried a couple of different panoramas in an attempt to capture the most appealing composition. 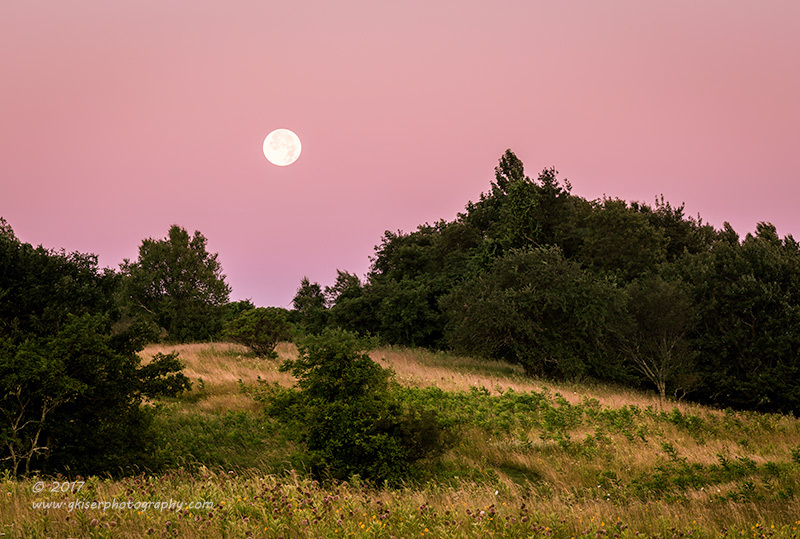 Probably the most complete composition included the setting moon to the right of the trees. The vast emptiness of the sky to the left balanced the entire frame out, and the red gate made for a book end on the left side. It is rare for me to photograph a scene void of any clouds, and even more rare to do it as a panorama. The draw to the entire concept was the division in the sky, and that replaced the clouds as a visual element. In short, this view was much more interesting than the actual sunrise to my rear. The sky had long since gone completely white and the sun was dazzling as it inched up into the sky. The only color to be found was to the West, where I was shooting. Hey, what can I say, I had prepared for a sunrise with no clouds, and it was working out well for me. I also had the added element of the moon to play with. As you can see from the opening image (Moonset), I made a lot of use out of the moon. It is funny that my first successful moon image was taken from this very park back in the winter as I was trying to capture a sunrise from the top of the ridge that appears in the above photo with the twin trees. Here we were once again, shooting the moon, in a completely different part of the sky. The feel of these images is worlds apart from the previous, as I am making use of warm dawn colors that the sky is offering. As the moon approached the horizon, I positioned the camera so that I could get it dropping into a cradle in the distant trees. I composed a very tight shot on the moon, and found that the sky was a very interesting shade of pink. In fact, there was a rose color cast over the whole scene, but for some reason it looked natural. I really wasn't sure if I would like this particular composition when I got home, but I shot it anyway. As I was processing it, I started to look at it, and began thinking about some alien planet. It all really came together, and I decided that it was an interesting enough photograph to warrant filing along with my keepers. It isn't one of my favorites by any stretch, but it is a little different from my norm, and that was what this trek was all about. With the sun well up into the sky now, the colors I was seeing were pretty much gone. I still had about 45 minutes to play with before I needed to be heading home so I moved over to Wildcat Rock where a photographer friend of mine, Bonita Loggins has spent a lot of time. I found the overlooks, but there wasn't anything of interest there with the current sky. I started to look around in the woods to see if there was anything interesting I could work with before heading home. 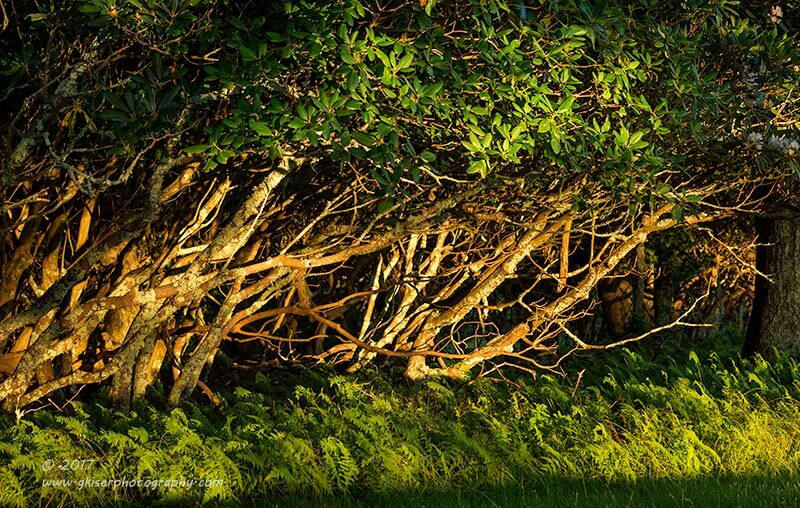 Almost immediately, I saw a quagmire of trees atop a bed of ferns bathed in the warm sunlight of morning. This was quite interesting in an abstract kind of way. It was just the picture that Toni would like, so I decided to give it a try. I kept my 70-200mm lens attached and framed up a composition that I thought captured the essence of what I was seeing. I chose to go with a narrow depth of field to keep the attention on the trees, and also to help speed the shutter up as the wind was still blowing something fierce. I cranked off several frames from this location as the lighting changed, and the wind speed varied. I also tried a handful of compositions trying to get one that I liked the best. In the end, I settled on one that I liked the best and I showed it to Toni. She really liked it as well. And then I showed her the other contenders. Since this was a composition for her, I wanted to get her opinion on things. She pointed out one composition that I had liked, but didn't bother to edit. She liked this one better, and so I pulled out the "Develop" module, and started to work the RAW image. It became Summertime Reach, and I actually do like it better than the other one that I had originally selected. While we are on the topic of Toni pointing out images that she liked better than those that I had already worked, I have to give credit to her for the opening image. I had left it on the table after deciding that the panoramas were really good. The intention was to omit the single shot images in favor of the large format compositions. However, Toni pointed out that she really liked it...so, I brought it into the editing window and started to work on it. The more I fine tuned it, the more I decided I really liked it. That is why we make such a great team. She sees a lot of potential in shots that I overlook due to having been so involved with the scene for so long. She has saved me numerous times from tossing really good images out the door, and do appreciate her for that! I was starting to get fed up with the wind after working the gaggle of trees, and was about to pack it in for the day. However, when I turned around, I found yet another scene that I liked. This one was backlit by the sun, and showcased the long grass being blown about in the wind. Instead of fighting against the wind, I decided to harness the power of the wind, and use the motion in the composition. Still using the long lens, I set up the shot that really made use of the backlit grasses, and dropped the ISO back down to 100 where I much prefer it to be. With an aperture of f/5.6 and an ISO of 100, I was still shooting with a relatively fast shutter into the sun. It was enough though, to add a certain dreamy quality to the image. The visual anchor was the small tree which was rendered sharp. Everything else is either blurred by depth of field, or by motion. The backlit grass creates a heavenly quality, and it just has a certain "feel" about it. Again, this was not my typical image, and it fit with the day for just that reason. Today really became about stepping outside of the box. It is rather scary outside of that box, but I needed it for my own personal growth. Personal growth aside, it was getting too bright to continue, and just like I had planned, it was time to head home. Had there been clouds, I could have gone for hours more, but in the summer, good lighting lasts only a little while when the sun isn't diffused. I had made great use of the hour and a half that I was out there, and was rather surprised at the number of pictures that I had captured. I saw decent potential in many of them as well. I would know more when I got home later in the morning. Oh yeah, I forgot about something. What about that truck in front of the store? I'm going by it on the way home, and I'm pretty sure that the sun will be lighting it up by the time I get there. Might as well stop and check it out in the daylight to see what it is all about. When I pulled into the parking lot, it was completely empty which was a great thing! The truck was all alone, and parked underneath a red, white, and blue banner that was undoubtedly still hanging from the Fourth of July. The store itself, looked like a slice of Americana as well. The best part...the sun was lighting it all up, and it was ready to be photographed! I parked near the road so I wouldn't get in the way of any potential shots, and started to build the camera. I decided on using my 24-70mm which is one of my best lenses for automotive work. I added an intensifying polarizer to make the colors pop and to remove some of the glare from the glass of the truck. As I was building things, I saw a deputy pull in and park to the left of the truck skipping only one space. Well drat! So much for having the parking lot to myself. He went to the door and waited before being let in by the store employee. As this was going on, another car came into the parking lot and pulled to the opposite side on the other side of a median. Things were getting crowded, and I needed to get these pictures done quickly before I lost the chance. The exposure was difficult to say the least. The truck was black, and it was sitting in front of a brightly lit white store front. I needed to keep detail in both the darks and the lights, and quite frankly, this was going to be hard. I had dialed the camera back to 100 ISO which was where I was most comfortable, and had the most control over the noise in the image. I started working on compositions that I thought would work, but none really captured the truck and the banner to the rear. I finally got in close and went kind of wide with the lens to capture a front quarter shot. This was the best vantage point I could find, but I wasn't sure if everything would expose correctly or not. The histogram looked good, and I was thinking that I had a complete range of tone information in the digital negative. It was going to be up to Lightroom to pull the details out from here. 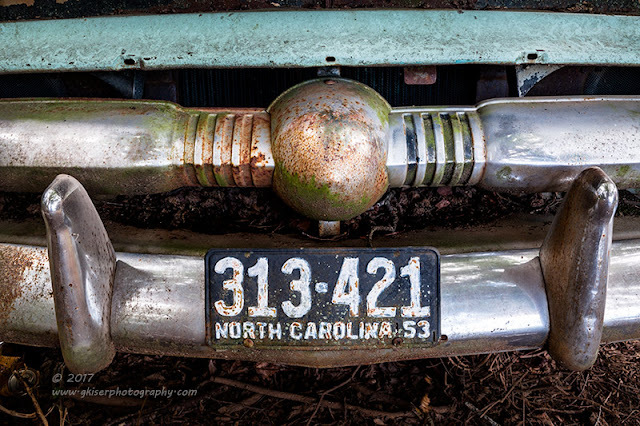 I've always enjoyed the "face" of these old vehicles, and each one of them has a personality. Because of that, I decided to get a straight on, in your face kind of shot. I wanted to showcase the red pinstriping on the grill slats, and put the banner right over the truck. I flipped the camera on its side, and dialed in a composition that really highlighted the front of the truck. Knowing that I was going to have a real hard time with the exposure, I decided to give this one the HDR treatment, and I shot 4 frames at different exposures. When I blended them in Lightroom, it turned out pretty darn good. There was still plenty of contrast, and not much in the way of the typical HDR look which I was quite happy about. It was just an honest, clean image with lots of detail to work with. I do have to admit though...it was strange working with a truck in this good of a shape. I'm very used to rust and dust. This was a nice change of pace, and fit right in with thinking outside of the box. When I got home, I had shot a total of 91 frames since first light. Considering that I had done multiple panoramas and an HDR image, that was still a bunch of pictures for a short amount of time with the camera. I was figuring on maybe three or four images when everything was all said and done. I was really surprised to have six out of the bunch that I really liked, and then Toni added another three to the bunch. What can I say, it was a successful day at Doughton Park! There is nothing quite like celebrating Americana on the Fourth of July, and to me, nothing quite says Americana like looking back at years gone by. The question becomes..."How exactly to do that as a photographer?" Fortunately for me, I love photographing subjects that have been long forgotten. It is part of my Wabi Sabi approach to photography. Basically, I find beauty in things which are in a state of decay. Wood, or steel holds a great potential to develop character as it ages, and moves beyond use. I try to keep a running list of places where I can photograph these things. This evening was feeling like one of those times, and I started to go through my list. There were two places I was feeling like going, and both were relatively close to the house. 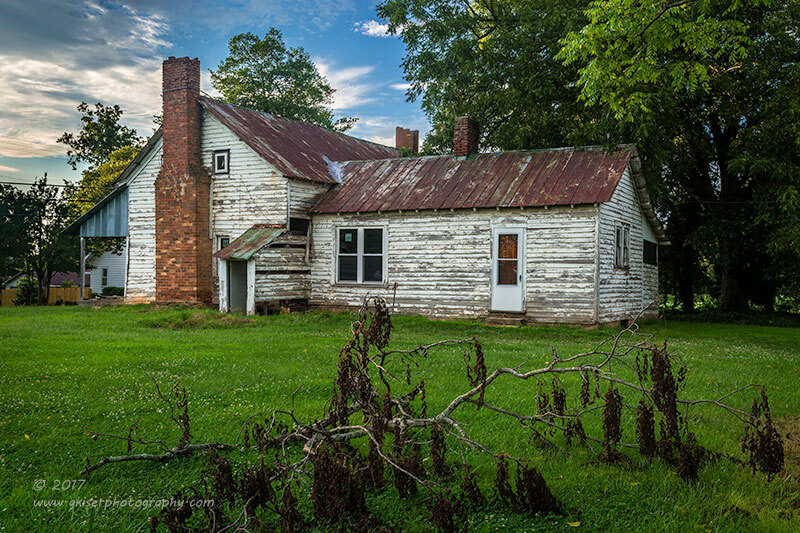 One of which was an old farm house that is just a tad over a mile from my house. I have photographed it about three times in the past with varying levels of success. 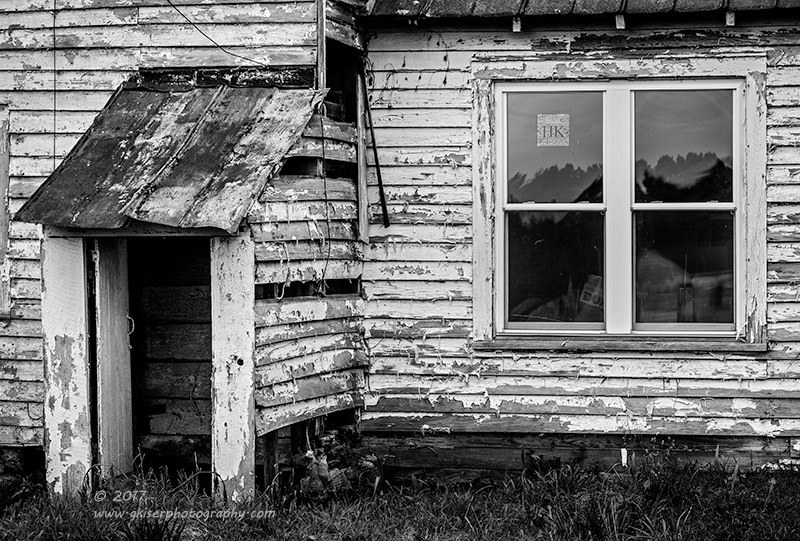 Over the years it has become more and more dilapidated which has sparked my interest in it once again. The first time I photographed it, and thus far my favorite time, it still looked rather nice. Now, some 10 years later, it has lost that polish, and is looking right sad. My other option was an early 80's model El Camino that was backed into some kudzu near Ogburn Station. It was a little newer than I like to photograph, but there was something about how it was sitting that keeps catching my eye. The major problem with that car is there is a trailer parked right next to it, which will really limit my compositions. In both scenarios, I was going to have to include the sky. This meant that I was going to need some interest in the sky. Well, we were having some showers pass by, and the clouds were ever changing. I was thinking some deep storm clouds would be great for the El Camino, and some lighter clouds for the old farm house. As I was looking out of the back window, all I saw was solid overcast. That would work for neither subject. But, as 7:00 came closer and the rain was supposed to be out of the forecast, the sky started to break up to the West. That meant that I would have some blue sky to work with shortly. I made the decision to photograph the old house over the El Camino because I would have better lighting on the house. Since the house was so close to my house, I decided to go out for a little walk. Nothing makes you feel quite as strange as walking through a neighborhood with a large camera backpack on while carrying a tripod. So far, I'm the only one I've ever seen do this, but then again, everyone knows I'm a little strange so they shake their heads and go back to lighting their firecrackers. It took about 15 minutes or so to get to the house. It was largely in the shade, and the clouds were still pretty thick right over the house. One of my biggest challenges with this house is the power lines that go right past the front porch. They are all but impossible to keep out of the frame. 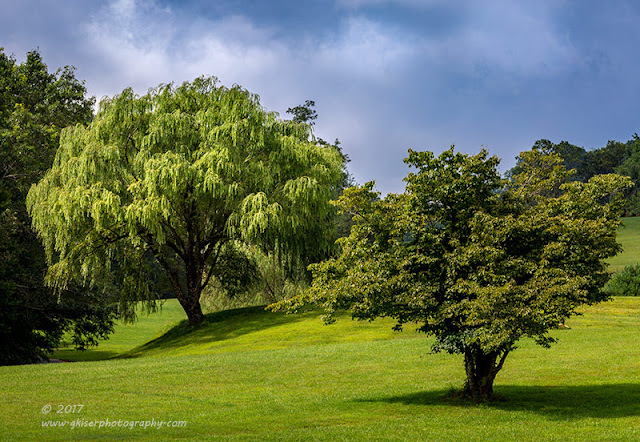 I figured that my best chance was to shoot with my 70-200mm lens, which would also minimize the sky in the frame. I got lined up at the edge of the field, being careful not to disturb the crops that were growing. I found out very quickly that the sky was just too bright for the exposure to be even close to even. I added a 3-Stop ND Grad at an angle to control the exposure. It worked, but there wasn't enough interest in the sky. Instead of waiting for the sky to change, I decided to move in close to get some detail shots of the house to show the progression of age. I kept the same lens, but stripped off the Grad filter. Since the house was largely white, I actually shot these intimates with a monochrome concept in mind. As I got in close to the house, I saw the stickers in the windows which said "HK Windows." This was obviously a home improvement situation, and they were starting with the windows. The irony here was nearly comical, and I chose to embrace that dichotomy in my photographs. My favorite composition from the intimate set showcased one of those windows and a cellar of some sort. I liked the geometric lines and the textures so that meant that it would make a great monochrome image. Oddly enough though, I really liked the color image as well. There was just enough color to really make elements pop, and added to the textures. In the full resolution image, you can make out every splinter in the wood, and ever flake of paint about to fall away from the siding. There is so much story here, and the plot twist is the replacement windows. The sky still wasn't doing me any favors, but I was trying different compositions with different filters. Nothing really made an image that I would call "art worthy", so I bypassed a lot of compositions and kept looking. I had seen the open sided barn in the back yard of the house several times before, but hadn't really seen much photographic potential. There was even a dusty old 60's pickup parked in there, but again, I had not seen much potential in it. Since I was waiting on the sky, I decided that I could give it a little bit of a try though. The barn still held no interest for me, but the truck was catching my eyes with all of the dust on it. Judging from the inspection sticker (May, 1992), this truck has probably been in this barn since I was fresh out of high school. It was cluttered with your typical barn stuff ranging from doors to lounge chairs. In the past, this was enough to keep me from photographing this old truck. Today was a little different, I saw the "junk" as part of the story of this truck. It gave it a sense of place and history. All of a sudden, the scene made sense to me. I still had my 70-200mm lens on the camera, and I figured that to avoid getting too close to somebody's property, I would keep my distance, and go for the telephoto shot. That actually worked well for the image since there was a support beam right next to the truck. Had I gone in close with a wide angle lens, I would have undoubtedly distorted the beam. Plus, I would have put more of the cluttered background in the image. At about 135mm, I was able to keep the background to a minimum, but have enough of it to tell the story. The beam was fortunately placed in a way that it wasn't dead center in the frame, and I could get it positioned in a way to where the truck wasn't obscured too much. The composition worked, and the lighting was getting better with the clouds clearing away from the sun. 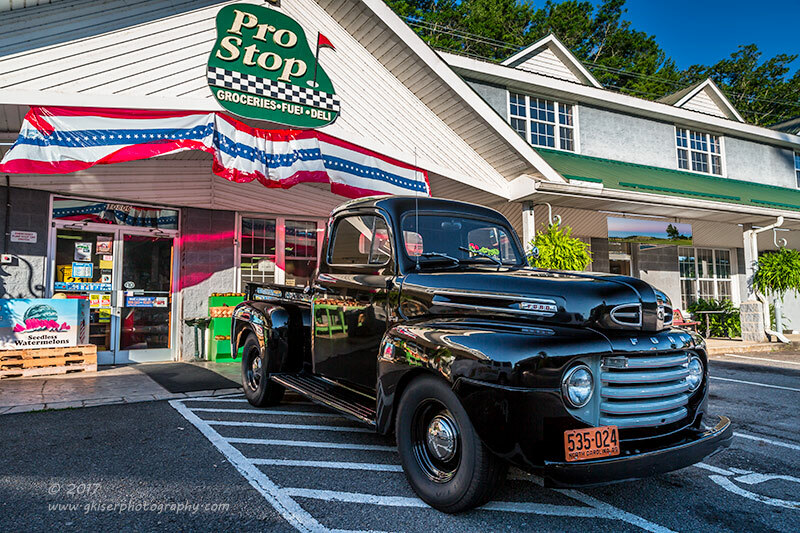 I shot about 10 frames of this truck from various locations, and different compositions. In the end, the most direct image was the one that won out over the others. It was simplistic, but yet had more layers than an onion. Even the dust on the windshield conveyed mystery about this truck. You can look at this picture for hours, and only come up with more questions. I started to fire off the camera in quick succession to make sure that the sky didn't move too much. The house was pretty much in the shadows, and the setting sun was not too far out of the frame to the left. This was a very difficult shot to make, and quite frankly, I wasn't sure if I was good enough with HDR to make it work, and still look natural. I made two different attempts with slightly different compositions. The first one was eight frames and the second attempt was nine. When I looked at the final compositions when I was editing the pictures, I found the tighter composition worked out better than the one that gave the dead branch breathing room. Well, I went out tonight to photograph this old house in an attempt to get something special. At first I was thinking I was going to be disappointed, but when I reached into my bag of tricks, I came away with an image that is better than that favorite of mine from years ago. While I used a few digital tricks to create this image in the modern dark room, the success of this image is due to the photographer's vision, and not digital manipulations. Considering that I went out on a spur of the moment decision, I am very happy with what I brought back from the trek. I shot 51 images, 17 of which represented just two images (the HDR ones), and I came away with four keepers from the evening. That is a success in my books, and I had another opportunity to work on my HDR technique which is still relatively new. This is only my second image to use that technique. Now that the fireworks are winding down, it is time to get things finished up and get to bed. My day job awaits me in the morning. I'm really starting to think that the weather forecasters aren't even trying anymore. I could have flipped a coin and gotten a better idea of what the weather was going to do today. It all started last week when I had planned on going to South Mountain State Park which is about two hours away from home. The weather was looking decent for waterfall photography as of Friday night. However, Saturday morning, all of the clouds were magically gone from the hourly forecast. I opted to stay home. Of course, later that day I saw lots of pictures from the mountains that looked like there was great lighting available for waterfall photography. I win some, I lose more. The same formula applied for Sunday when I also opted to stay home. A week went by with me still wanting to get to South Mountain. You see, the draw for this park is not really the main waterfall (High Shoals Falls), but the smaller cascades downstream from the main drop. While the trails at South Mountain are awesome, the observation deck is just too close to the main falls for me to really like photographing it. Conversely, the secondary cascades aren't encroached on nearly as much by the walkways. I have tried to photograph them several times, but without success, and I was wanting to try my hand at them once again. 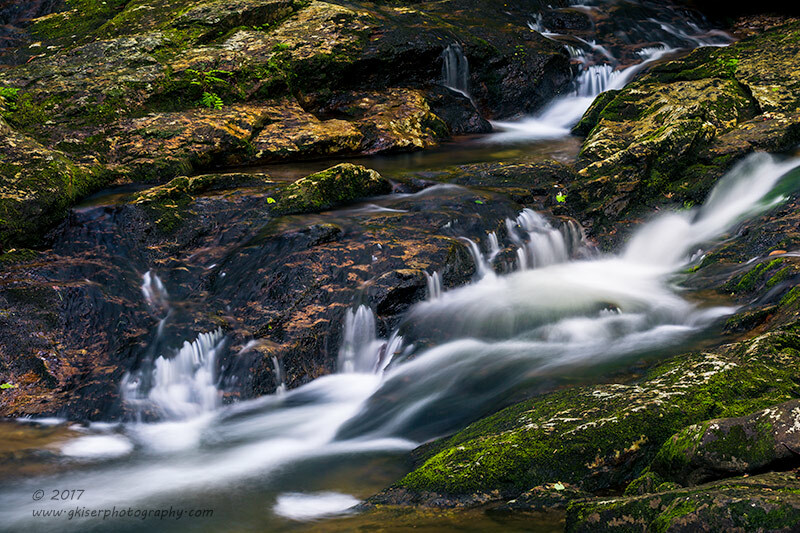 By the time the weekend rolled around, the weather was looking great for waterfall photography. The cloud cover was looking like near 90% for most of the morning and then gradual clearing. I went to sleep looking forward to heading out to South Mountain first thing in the morning. When Toni woke me up at 4am, I looked at my phone to check the weather. From 8am on, it was looking like intermittent cloud cover, with a coverage of 70%. I know what that means...blue skies. BUT...I remembered last weekend all too well. With Sierra at my Mom's and Toni going to work, I really had no good reason to stay at home, so I got up and got ready to head out. When I left, it was raining slightly and that made me very happy because that meant that there would likely be clouds in the sky. The further I traveled West the more rain I came in contact with. When the sun started to come up, I could see low clouds, and an overcast sky. Well, what do you know? I won this bet with the forecasters. I was really looking forward to doing some great waterfall photography in the next 30-45 minutes. I couldn't ask for better conditions! Is that blue sky above the low clouds? Yep, the clouds were breaking up quickly. The rain had stopped, and the overcast was being replaced with a clear blue sky. Only a few low clouds remained above me. I had already driven over an hour and a half, so turning around wasn't an option. I decided to go into "Plan B" mode and start to look for barns and old cars along the route. None were found, and I kept plowing on to the park. At this point, I was hoping that the part of the park where the waterfalls were would still be in the shade. It was my only chance at this point. My sunglasses were even on! When I got to the park, the sun was in full swing, but there were sections that were still in deep shadows. I had hope, but not much. I did know that if my intended subject was in the shadows, I didn't have long before everything would be in the full sunlight. I grabbed my bag and tripod from the 4Runner and started off at a full on speed walk down the trail. It was nearly a mile to reach the lower falls, and that would put me about 20 minutes hiking. While it wasn't hot yet, the humidity was at least 346%, and within about five minutes, I was turning into my own waterfall. By the time I got to the Jacob Fork River, I was actually adding to the water tables with my sweat. I passed by a few decent spots to get some pictures. This was a gamble because the lighting was good at several sections along the river. I said years ago that I would never feel guilty stopping along this hike to grab some pictures because the main falls wasn't that great. But...this time, I had very little time, and I really wanted to try some different compositions with the lower falls. I rolled the dice and continued on down the trail. When I finally got to the lower falls, I was pleasantly surprised that they were deep in the shadows, and almost too dark. I was also let down by the water flow. With the rain that had passed by overnight, I was expecting a little bit more than I saw. But so is my luck, so I embraced the lighting and looked for a composition. That wasn't an easy task at all. From the wooden boardwalk, I could see a decent view of the first section, but it was slightly covered by a branch. Also, the position was a little too high to get the perspective I was after. I looked and I looked, but the only way to photograph this was to get below the walkway. I had never done that before here, and usually try not to leave boardwalks so as not to destroy any of the natural areas. I could see where there was a little trail right beside of the boardwalk where others had been before me. I decided to get down to that area and set up at the base of the waterfall. It was slippery, but not too bad getting down there. Once I arrived, I quickly sized up the situation, and grabbed my camera with the 24-70mm lens attached. I added a polarizer, and mounted it to the tripod. I started to work out compositions, and oddly enough, it was my first composition (out of six) that I liked the best. A Thoughtful Spot is a fairly simple composition that has some visual tension from the landscape format. 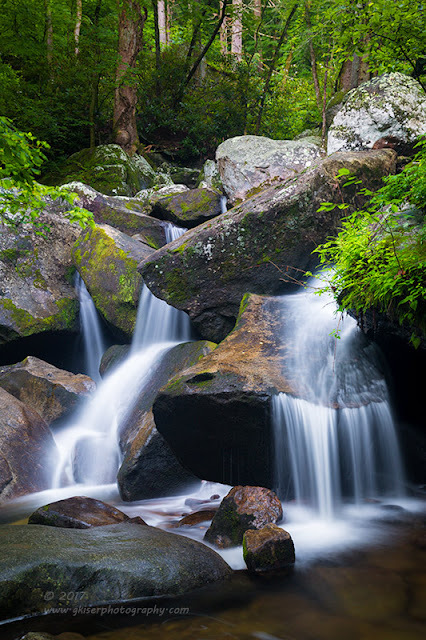 The actual falls are much more suited to a portrait shot, but including the trees, and more of the rocks on the sides gives it a little more of an open feeling. The lighting was a little tough here because the sun was starting to light the trees in the background. That was taken care of with a slight ND Grad filter. The main focus of the scene was still well in the dark, and I had a hard time getting a shutter speed less than 10 seconds which is very unusual. I finally got an exposure that I could live with, and shot several compositions before deciding I had better move on while the lighting was still favorable. After I managed to get back up on the boardwalk, I started back down the trail to find that there was another section to this waterfall which I had forgotten about. Fortunately, it too was in the shade. I started to look for compositions, but found nothing but disappointment from the walkway. It looked like I was going to have to shimmy down below the walkway once again. I found an area I could traverse on the far side. I worked my way down and started to look for a composition...Nothing! I couldn't find anything worth shooting here at all. The angles were all wrong. I scurried back up on the walkway and moved back on the other side and looked for a way back down to the bottom. This was a little more difficult and took a bit of acrobatics, but I finally made it to the bottom. From here, I still found it difficult to get a good composition. However, I found a rugged perch that I could set my tripod up on that still gave me a reasonably stable area to stand. I found a rock to open the camera bag up on, and put the 24-70mm lens back on with the same polarizer. I mounted it to the tripod which was part in the water and part on a web of roots. I was standing calf deep in the water to be in the right position. When I looked through the viewfinder I found a lot of satisfaction in my location. My first shot, Harmony, included the root system that the camera was set up on, along with the tree they were connected to. The depth of field was not quite what I wanted, but it was passable. What I loved about this shot was the framing from the roots and the swirling water in the pond. I only took one shot here because I honestly didn't think that it would turn out all that great after processing. I should have worked that one a little more than I did. After doing the processing, I could see that I was actually onto something with the composition. Not sure how the shadow areas would work out, I flipped the camera into portrait orientation and cropped in close to the waterfall. 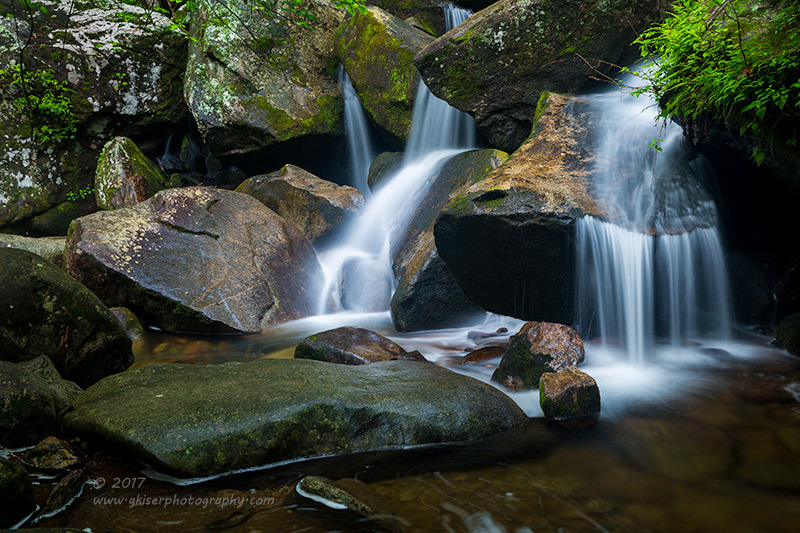 Rocky Passage really filled the frame with what I found so interesting about this particular waterfall. 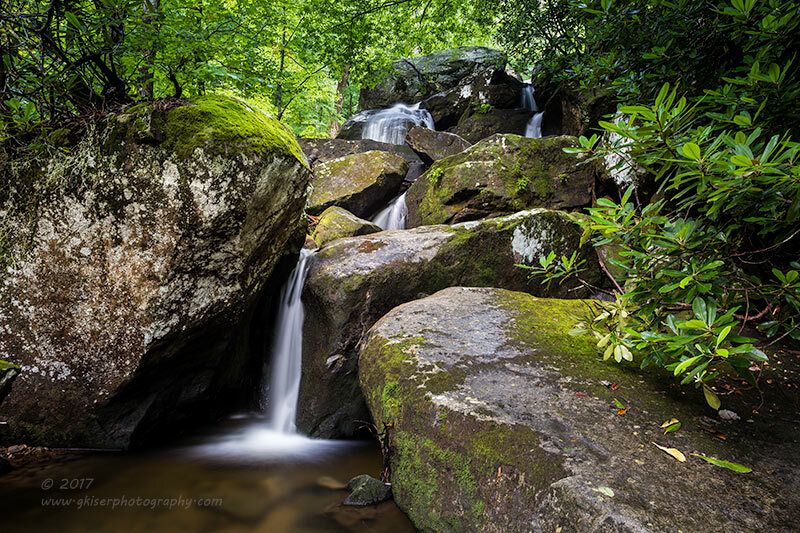 The composition came together quite nicely and showcased not only the waterfall, but the large rocks that created the falls, and the textures of the forest behind it. This is an example of "filling the frame with what you like" being used to the best of my ability. The composition is very succinct and simple. The visual impact is evident, and everything that I wanted to convey is right there with no added elements. This one shot has become my favorite from the morning, and had I gotten no more images, the trip would have been worth while. Of course, I have never been one to stop until I had exhausted all of my options. I again flipped the camera back to landscape, and filled the frame with what I wanted. This time, I omitted the forest background as it was starting to get too bright. Instead, I concentrated on the twin cascades. The single rock jutting out from between them looked almost animalistic in form, and became the visual anchor for the picture. 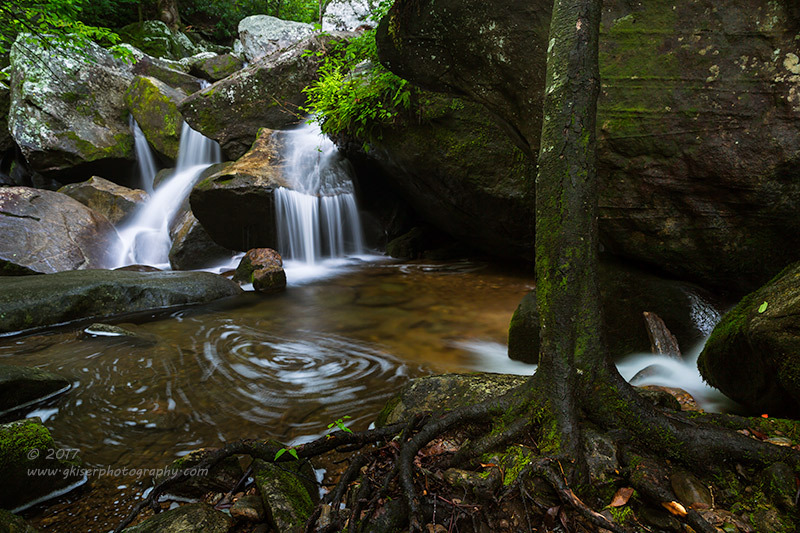 There was a rather nondescript flat rock at the base of the falls which made for a great foreground interest. Those were the elements that I composed around. While I got in closer and more intimate than the last one, this image is a little more complex in its design. Despite being "up close and personal," there is still quite a bit of room to breathe around the water. I like this shot, and it looks like a great place to just sit and absorb the sounds of the water. With the sun getting closer to the top of the mountain behind me, I decided it was time to pack up and get to moving again. I did my best Spiderman impersonation to get back on the boardwalk, but I'm sure it looked more like a toddler trying to escape a crib. I decided to continue down the trail to the main falls to see if maybe I could work a composition using the boardwalk as a foreground interest. I got about 150 fee from it (still a good deal of climbing) and saw that the sun was already lighting the area directly above the falls. By the time I got there, and got set up, it would be on the top of the falls. There was no need in going any further (and I hate climbing stairs). I worked my way back down the trail, passing the area where I had just spent an hour working. I was quite satisfied at how the morning was going, and I felt pretty confident that I had a handful of images for the 30 or so frames I had shot. It was looking like that was all I was going to have because the sun was really starting to hit areas around the trail, and that meant that I was going to be out of luck in a very short amount of time. I happened to see a spur off of the trail that went to an observation deck over the stream. Well, there must be a reason for them to have built this, so I went to give it a look. What I found was an interesting set of rapids. It was not really a waterfall, and it wasn't really a mountain stream. I'm not sure exactly what this was, but there were a couple of sections where the water was nice and frothy. There was also a tree in the way for a perfectly clear shot of the area. I looked below to see if I could possibly get a better composition from ground level. While I might have been able to, there was a large rock I would have a hard time getting past, and had a better chance of shooting over it from the observation deck. My only chance in getting past the tree was using my 70-200mm lens, and setting the tripod up hanging over the railing of the deck. I had my recipe, and I built the camera accordingly along with an intensifying polarizer. It wasn't the easiest thing to make a composition that made sense with this set of rapids. I tried a couple of different ideas, but they didn't really make sense. I then decided to concentrate on the repeating (similar) rapids near the tree on the right side. I flipped the camera on its side and framed it up. The two rapids were similar in shape and direction. The smaller one was further away which added to the sense of depth which was important due to the angle I was shooting at. I also found a very small cascade in the upper left of the frame that provided a nice visual balance. The trees over the rapids helped to direct the eyes through the frame by completing a gentle curve started by the first rapids. It wasn't a usual composition for me, but I felt that it made sense, and worked well. While shooting that view, I found that I really did like the repeating shapes of the two rapids in the foreground. So, going back to my favorite mantra "fill the frame with what you like," I decided to flop the camera back horizontal and zoom in on the two rapids. With this composition, I lost all sense of depth, and scale. What I was left with was textures, light and dark, and different intensities of color. When I was editing the image, I found myself getting lost in the frame just "feeling" with my eyes. I did a little bit of dodging and burning to add interest to the areas that I was pausing on, and eventually came out with this abstract rendition of the scene. This one really turned out cool, and it was one that I was thinking of Toni when I was working on. She loves abstract pictures, and since this one has very little visual clues for size and scale, it falls in that category. 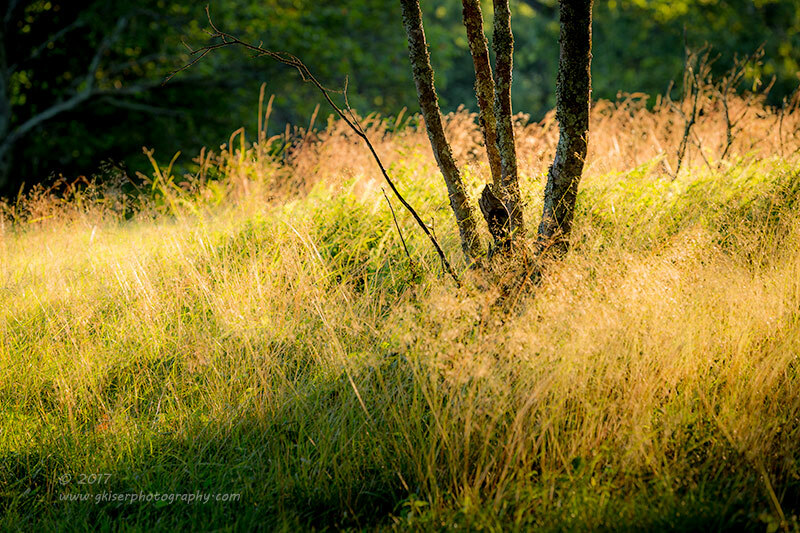 By the time I was done with this scene, the sun was starting to blaze through the trees. There were also a good many hikers starting to appear. My time with the camera had come to an end. I had shot about 40 frames in two hours. Since I was really expecting the sun to ruin my morning, that two hours was a gift, and the 41 images I had shot were all bonuses. I felt really good about what I had shot, and knew that the trip was worth my while. When I sat down to edit them, I was pleasantly surprised at how many good shots I had gotten. 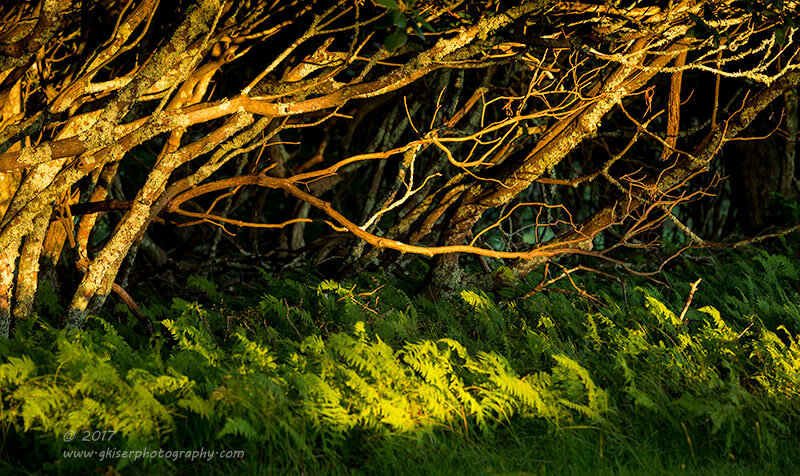 My one regret was I didn't spend more time on the composition with the tree and roots. There are a few aspects of that shot I could have improved on, but overall, I am really satisfied with what I have from this trip. On a side note, it was supposed to be sunny this afternoon. I'm sitting here at the desk at 3:17 looking out at a totally cloudy sky with thunder in the background. Yeah, I could flip a coin and get the weather right more often. Maybe I'll be able to head out here in a few hours and get another couple of shots for the day. It could happen. Something that you might notice on these images is a new watermark on the images. I have decided to replace my tried and true "© 2017 G. Kiser" with the current stamp on the images. With all of the online sharing going on, I decided I would be better served by putting my web address on the images rather than my name. This will make image sharing much more beneficial to me in the long run, and make it easier to track me down when looking at the pictures. One of my goals after all, is selling prints to help offset the cost of my hobby. Thanks for dropping by and sharing in my adventures!